I was up at 6am today. Not as terrible as 5am, but on labor day, that’s still a pretty crappy time to be awake. I went for another run, followed by some yoga. Then I sat on my patio for a nice breakfast and reading session. I finished The Marriage Plot and was pretty disappointed. I had such high expectations after Middlesex, so my disappointment was inevitable. I’m trying to find something to read next, which is sort of funny all on its own. About a quarter of the books on my shelf haven’t been read. A customer from the coffee shop I used to work at gave me the The Letters of Anton Chekhov. That seems like a nice thing to read, right? Meh. I went through a phase a few years ago when I was obsessed with Chekhov. I ripped through a collection of his short stories in a week (probably the same week the customer gave me the book), and haven’t picked up a story or play of his since. Had I read his letters right after those short stories, I probably would have gotten some insight into his life and personality, and I probably really would have appreciated it. Now? Nah. I also have the Norton Collection of Personal Essays that I found at a used book store for $7, but I’m trying to stay away from shorter works. I wandered over to Carissa’s shelves today and found A Million Little Pieces. I don’t know much about the book other than it claimed to be a memoir and ended up being false. Also, something about drugs. And Oprah. When this book blew up, I wasn’t interested in memoir. I sort of regarded it as a lame fad: just uncreative and self-indulgent people who wanted to write but couldn’t write fiction. I was a Fiction Writer, interested in the construction of character and plot. Then I took a memoir-writing class at UW-Milwaukee and that changed. 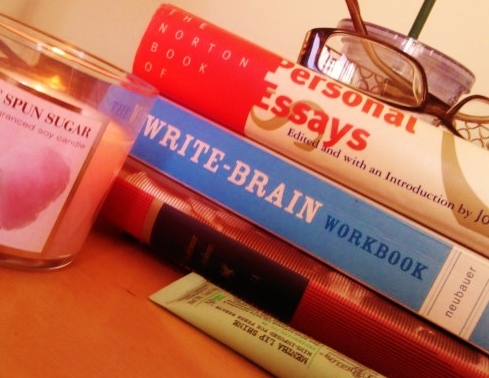 I realized that my fiction elitism was unwarranted since I was an unrealized memoirist at heart, what with my incessant journaling (I did more digging, my journaling slowed most during my junior and senior years of college). Then I started reading memoirs and essays and found that I loved how truth could be stranger than fiction. 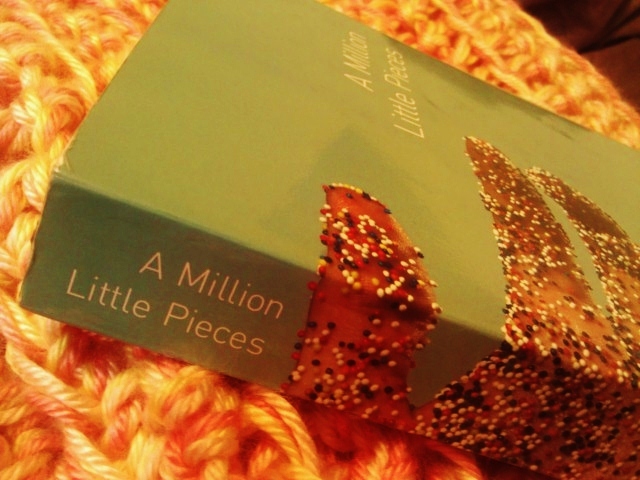 So I have mixed feelings about A Million Little Pieces. Now that I write memoir I’m aware that I have an obligation to be honest. I had a few autobiographical fiction assignments in college, and I was so confused about them. I allowed myself fictional retribution – ending a relationship when I should have, dumping beer on his belongings, wildly advertising his infidelity, slapping him more than just the one time, etc – but it felt sort of dirty. I was telling a story that had its roots in reality, but then ended it falsely. If my ex were to read it, he would surely point out all the fiction, expose me as a fraud, humiliate me, etc. And I would know he was right. I would face similar consequences if I paraded the story as fiction, only in a weirder inverted way. If I were to ever share those pieces, I think I would need to preface them with a disclaimer: “The following events are based in reality, though I’ve taken the liberty of replacing certain details and/or the ending with ones preferable to me.” And really, who cares then? The truth probably offers a better story than the one I give anyway. Maybe I’ll clean one up and share it later this week, then you can tell me what you think. Anyway, reading a fictionalized memoir is going to be an interesting experience. I’m going to have to tell myself it’s a novel if I don’t to feel completely cheated by the end of it.